When you create a contact-based workflow, you can set a workflow goal to focus the objective of your workflow and measure the success of your workflow in nurturing contacts. Please note: if you're a Sales Hub or Service Hub Professional or Enterprise user trying to unenroll or exclude contacts in contact-based workflows, refer to this article: Unenroll contacts in contact-based workflows with goals. Moving contacts to a new lifecycle stage (e.g., the contact's Lifecycle stage changes to Customer). Contacts taking action(s) that indicate engagement (e.g., the contact submits a specific form, clicks a specific call-to-action, etc.). Contacts reaching a number of interactions with your marketing content (e.g., the contact reaches a certain number of page views, form submissions, email clicks, etc.). 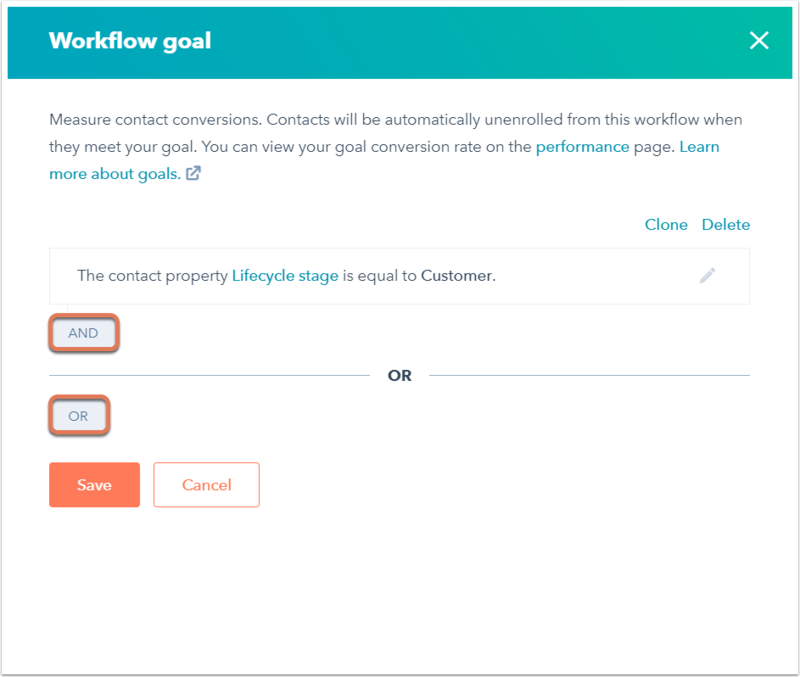 When a contact is first enrolled in a workflow, HubSpot checks if the contact meets the goal criteria. If they do, they will not be enrolled in the workflow and will not count towards the workflow's goal conversion rate. When a contact is active in a workflow and meets the goal criteria, they'll be unenrolled from the workflow. If they've been sent a marketing email in the workflow, they will count towards the workflow's goal conversion rate. You can identify active contacts that were unenrolled from a workflow as a result of meeting the goal criteria in the workflow history. Goal: used to measure the success of your workflow in nurturing contacts. For example, your goal criteria might include contacts who become a customer or submit a specific form while enrolled in the workflow. 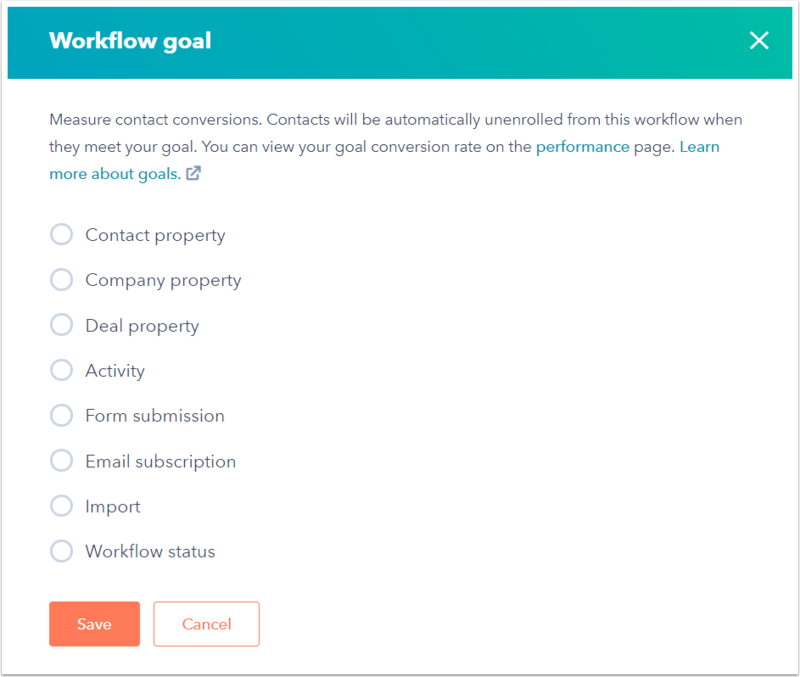 When a contact meets your workflow goal (and was sent a marketing email in the workflow), they will count towards the workflow's goal conversion rate. Suppression list: used to suppress contacts you don't want to nurture with the workflow. For example, your suppression list might include your competitors, contacts who are already customers, or current employees. When a contact joins a workflow's suppression list, or if they are already present in the suppression list when they are enrolled, they will not count towards the workflow's goal conversion rate. In the dialog box, select and set the goal criteria. Then, click Done.